We humans can learn a lot from geese. Yes, that’s right, geese. In fact, in 1991 Angeles Arrien gave a speech called “Lessons from Geese” that was largely based on the work of Milton Olson. What follows is my take on the story. 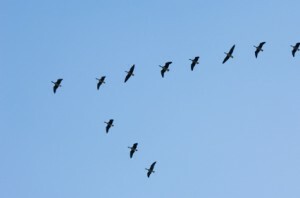 It’s truly a marvelous site to see a group of geese flying together in perfect V formation. Research has shown that as each goose flaps its wings an intense uplift is created for the birds behind them. Further studies state that this “teamwork” adds 71% more flying range compared to a goose flying on its own. Moral of the Story: Partnerships and teamwork rule the day. The days of the Lone Ranger are long gone (bad example, as even the Long Ranger had Tonto but you know what I mean). If you surround yourself with excellent people you’re far more likely to succeed than if you attempt to go at it alone. If you’ve ever watched geese fly, you’ve likely seen one fall out of formation. And when this happens the fallen away goose begins to struggle mightily until it manages to fight its way back into formation. Moral of the Story: Once you’ve established a good team stay together and work together. Sure, times will get tough and you may become annoyed with one another from time to time… but synergy cannot be created by a single person working in isolation. While flying in V formation the lead goose eventually tires and rotates to the back of the pack to re-charge their battery while another goose takes its place at the front. Moral of Story: It’s important to share the load amongst team members. It’s also important to ensure that all workers are cross trained and able to perform multiple tasks. As an aside, we recently added a skill matrix module to the Gemba Academy School of Lean that deals with this very situation. 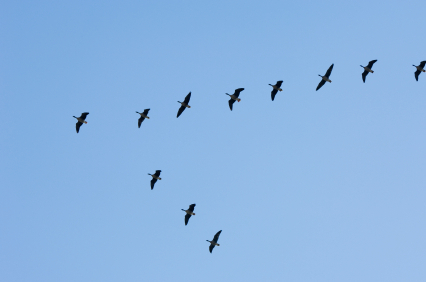 While it’s not always possible to hear from the ground, geese are a noisy bunch when flying in V formation. There are several theories of why this is. One theory is the geese honk to encourage each other… while another theory hypothesizes the honking is used to communicate where each goose is. You know, hurry up pal (honk, honk) I’m right on your feathers. Moral of the Story: No matter the reason for goose honking, it goes without saying that we should always communicate with one another offering encouragement as needed. We should also have ways to communicate when something is not right. This can be likened to the way lean companies “pull the andon cord” when a problem arises. Whenever a goose becomes unable to fly (becomes sick, gets a bullet in the belly, etc.) two other geese fall out of formation and stay with their fallen comrade until the impaired goose is able to fly or dies. Moral of the Story: The best teams I’ve ever been on were made of people who genuinely cared for each other and would always help each other out no matter the situation. It seems geese figured this out a long time ago. Do you agree with these lessons? If you are an expert in geese please feel free to share other examples or lessons we can learn from our feathered friends. Ron, you are incredible! This article is one of your best (well, aside the ones with your children as lean “gurus”. They are the best way to convey concepts that sound complicated when read in “serious” books. We can take one more lesson from geese flight that they fly in group to avoid any attack on them & can better defend themselves. Similarly In team if any new & unforseen problem arises,it can be solved very easily as a team & best solution can be arrived throgh brainstorming as compared to single brain. Thanks for the kind words, Tom. And thanks for the additional info Sunil. All the best! Geese are fanatically loyal to management, heh. They won’t let anyone or anything on your property. They’re innocuous about it too, just toddle over in a non-threatening way, one who doesn’t know better thinks “how cute!” until of course they start biting -which hurts, a lot. And they don’t stop. Even well-placed steel toed boots don’t slow them down. Geese are an attractive live yard-art solution to door to door salesmen and Jehovah’s witnesses, eliminating the need of fencing. We called our flock the “witness protection program”. Geese root out weeds and bugs, literally as it happens. I am so sorry that the last message I read was dated 2009 !! I trully believe what you are saying and your analogy is perfect. Especially Lesson 1..fits to a tee!! If as a manager you surround yourselfwith knowledgeable and excellent people,yes, you will succeed on behalf of their knowledge. I am so sorry that the last message I read was dated 2009 !! I trully believe what you are saying and your analogy is perfect. Especially Lesson 1..fits to a tee!! If as a manager you surround self with knowledgeable and excellent people,yes, you will succeed on behalf of their knowledge. These lessons are highly educative and can be used in strenghening group leadership.